• Finish reading two books. I struggled with this one last month so I'm hoping to dedicate a little more time to reading this month - if I manage to finish two books by the end of May, I'll be back on track for my goals of twelve books this year... I'm halfway through My Son's Not Rainman by John Williams, which I'm really enjoying, though I'm not sure what to read next. I have a few on my reading list for the year so I may just pick at random! • See friends at least twice. This shouldn't be too hard as my friends are having a housewarming party mid-month so one box is already ticked! I'm really looking forward to seeing their new home and having a good catch-up with everyone. • Get out on my bike at least once a week. I'm hoping for some decent weather to make this possible but I'll be happy with an average of once a week, so 4-5 times over the month... They don't have to be hugely long rides, around 15-20 miles is enough for me as that's a good hour to an hour and a half. We've all got to start somewhere, right!? • Get a place on the Clinical Psychology doctorate programme. I've got my interview in a couple of weeks and I'm really not sure how to feel about it - I wasn't expecting to get any interviews this year as it was my first time applying, so part of me feels like anything additional is just a bonus - but on the other hand, of course, I'd love to be successful! All I can really do though is make sure I'm as prepared as possible and give it my best shot - fingers crossed!! Aside from my interview and the housewarming party, I'm going to see John Bishop with my Mum towards the end of the month, which I'm really looking forwards to - I've seen him before and he's hilarious, so that should be a good night! 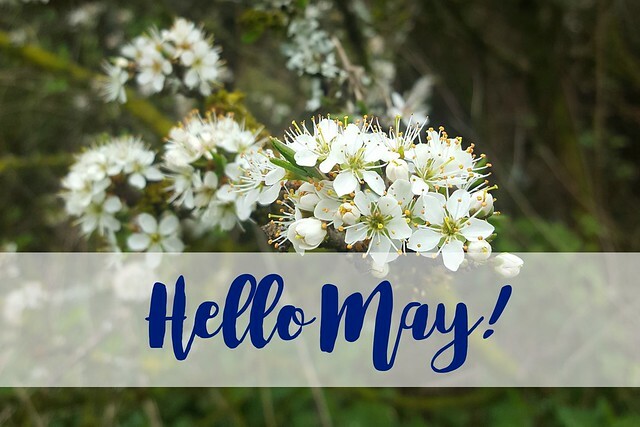 What have you got planned for May? I've love to hear about any goals you're setting yourself for the month! Well done for reading 2 books! I'm really struggling to fit in the time to read these days. Hopefully wish a holiday coming up I'll find the time to read at least one book. Sounds like you have quite a busy but interesting month ahead. Good Luck for your interview :) I'm doing a psychology PhD (not clinical) at the moment. Yes to getting out on our bikes more! I just had mine tuned up and am so excited for our first sunny day. I wish you the best of luck with the doctorate program. Good for you to reach for the stars! The clinical psychology programme sounds pretty good and I'm with you on the sweet treats - I've been just as bad lately! This year is just flying by, isn't it!? So great that you're going to be out on a bike more, it's fab exercise. Good luck for your interview!